Their guitars are certainly loud, and there are moments when Scooter Ward bellows. 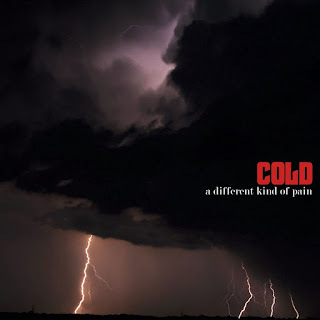 But with Different Kind of Pain, Cold has largely departed alternative metal for brooding electric ballads. Distorted notes ring out meaningfully as Ward dwells on despair, shame, and symphonies of sadness. "If God created love, did he make it for everyone?" This is a very similar trajectory to Staind's, where feelings matter considerably more than rocking, and the quest for redemption never seems to end. Cold did almost end, incidentally. In 2003, Geffen soured on the band in the midst of promotion for their sophomore album Year of the Spider. Internal strife followed; Kelly Hayes departed, and Terry Balsamo joined Evanescence. Ward even had sick family members to deal with. Still, the band regrouped with new members, and a new label in Lava/Atlantic. Maybe that adversity accounts for Different Kind of Pain's subdued, searching feel. On the title track, the sound of pattering rain gives way to reflective piano notes and more unguarded lyrics from Ward; a guitar surges forth toward the end, but instead of launching into a explosive solo it only sets up the chorus once again. This is a song slow-motion hugs are made of, and there's nothing metal, or even post-grunge about it. Heaviness isn't a requirement for the band to be effective. But unfortunately, like Staind, Cold often loses sight of real melody in their examination of the soul. Their songs might add a sweep of violins, or give a guitar a chance to chug out some rhythmic tension, but "When Heaven's Not Far Away" and "Back Home" are the only real standouts.